The manufacture and importation of cosmetic ingredients are still regulated under NICNAS (National Industrial Chemicals Notification and Assessment Scheme). The TGA is responsible for administration of the Act and any goods that are excluded. You should follow the Therapeutic Goods (Excluded Goods) Order No. 1 of 2011, noting the cosmetic products previously covered by The Cosmetic standard are included in this order. Product safety and cosmetic labelling standards (under the mandatory standard for ingredient labelling of cosmetics) will continue to be the responsibility of the Australian Competition and Consumer Commission (ACCC). 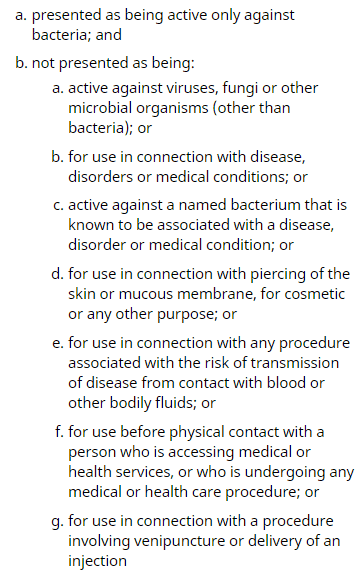 The ACSPA Code of Practice for household & commercial cleaning products claiming antibacterial action may be used as a guide however doesn?t really include skin antibacterial products and is not enforced under NICNAS or TGA. The NICNAS cosmetic standard can be found here.